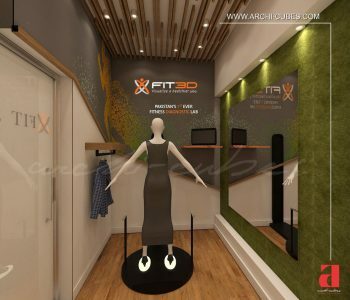 Our recent design proposition for Pakistan’s first ever diagnostic lab “FIT3D” is a mobile kiosk to provide a platform to track fundamental body changes. The idea behind the composition is to create a clean and simplistic space that is both welcoming and sophisticated. The aim as the project portrays is about achieving better design through simplicity – simplicity of form, space, materiality, detail, and color. The examination room that measures 8’x6’ is made up of MDF walls that rest on a steel structure that is made portable to meet the client’s requirements. One of the biggest challenges for our team was to make the kiosk look spacious but at the same time free of external obstructions that may hinder the machine’s performance. 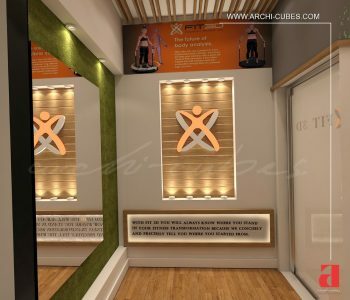 The cubicle is designed to achieve maximum level of comfort for the client while they get their body examined. Also, to make the interior space clear to eliminate the likelihood of the user feeling clogged in any way. The use of neutral colors in the interior details makes the space relaxing and tranquil for the customer. The muted grey and the wood palette suggest a soothing impact while the “Green” stands out and adds energy and freshness to the space. The exterior has been devised as a solid impenetrable surface to make the user feel relaxed and safe inside. The exterior has been conceived to portray ‘health’ and wellbeing’ of human body keeping it as modest and elegant as well as inviting for the passersby. 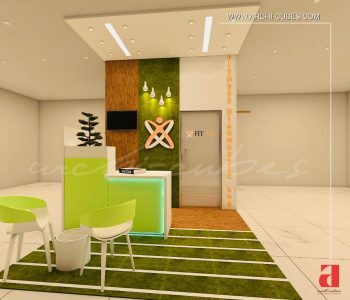 Careful consideration has been put into designing the suitable reception desk with a small planter also denoting “Healthy Living”. No doubt it is a successful attempt at creating a space to draw attention of the passersby to this advanced technology for health examination, being introduced for the first time in Pakistan.